Clark Stationery - Dabney Lee - Graphic Recipe Cards Go to Ivy + Anchor for all designs and monogram/color options. 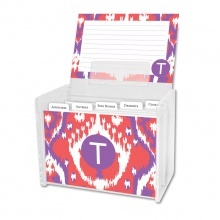 Item Name: Graphic Recipe Cards Go to Ivy + Anchor for all designs and monogram/color options. Description: Your recipes just got yummier with our monogrammed recipe cards! (refills available). Monogrammed recipe cards measure 4" x 6" and come with a lucite box that measures 4.5" x 6.5". You select your favorite style swatch and monogram type. Whether you use them for your own recipes or the ones you share with others, everyone will love these stylish cards. It is a perfect gift for a bride-to-be or someone who loves to cook and share! Background design (style swatch) is as shown, but you have your choice of any Dabney Lee monograms (see other other samples) in any of these colors: Hot Pink, Coral, Tangerine, Sunshine, Grass, Robin's Egg, Ocean Blue, Sky Blue, Navy, Fuschia, Chocolate, or black.